Grand Central Life & Style, 9781455566440, 336pp. A delicious love letter to the Gulf Coast's vibrant food culture. 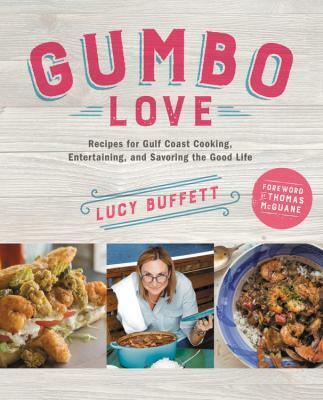 Since she was a young girl, Lucy Buffett has believed in the power of gumbo-the stirring, the transformation of the roux, the simple ingredients cooking up into something much better than just the sum of its parts. It's only fitting that she signs her name with "Gumbo Love" and that she makes a living feeding people the most delicious, soul-satisfying food. Lucy combines over one hundred new recipes with old favorites. She lives by her mother's philosophy: "Life is short-eat dessert first," so the very first chapter is filled with delectable sweets like Classic Southern Pound Cake with Strawberries, Buttermilk Orange Chess Pie, and Salted Butterscotch Blondies. Since you can't live on dessert alone, you'll find Gulf Coast favorites from Tailgate Shrimp and Crab Dip to Lucy's Signature Summer Seafood Gumbo, and Crab and Corn Fritters, along with dozens of other seafood appetizers and main dishes. And if you tire of seafood, Lucy shares her family favorites like Daddy's Fried Chicken, Beer-Braised Beef Brisket, Southern Fried Creamed Corn, and Greens and Grits. Incorporating stories from Lucy's childhood growing up in Mobile, Alabama, adventures traveling the seas as a cook, time spent working as a chef in New Orleans, and her philosophy of relaxation, gratitude, and seizing the day, this cookbook entertains and inspires as it serves up recipe after recipe, each tastier than the last.